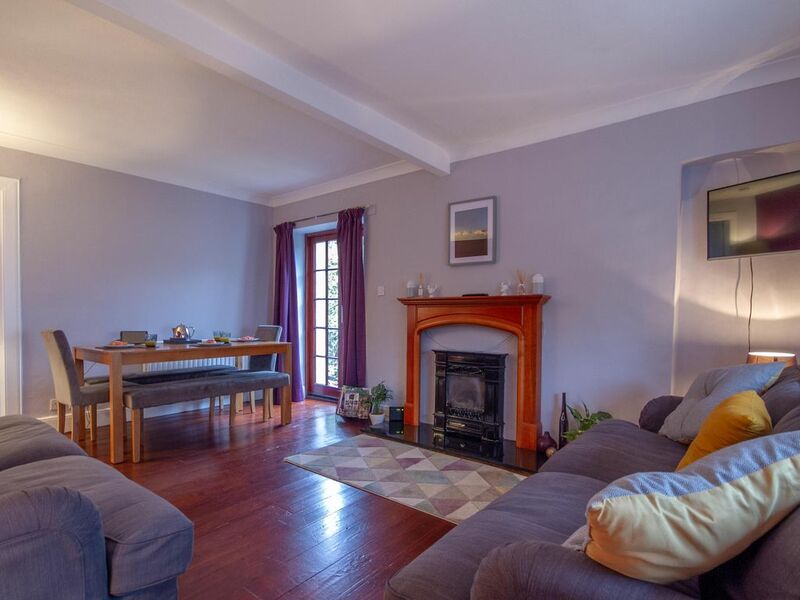 Pillow proudly presents The White Cottage, a Three Bedroom Cottage situated centrally in the popular Perthshire Town of Auchterarder, North of the Ochil Hills in Perth & Kinross. Auchterarder is known locally as ‘Lang Toun’ due to its 1.5 mile long High Street and being home to the famous Gleneagles Hotel. The White Cottage is a beautifully presented accommodation available for short or long term stays, suiting both holiday makers or business professionals. Golfers, Cyclists, Walkers would all find this Cottage extremely comfortable and practical. Lengthy utility with access from the external garden is the perfect storage place for all your outside attire. Entrance to the ground level WC is spacious enough to hold golf clubs or bicycles. The Cottage is just a five minute walk from the Town Centre and the world renowned Gleneagles only 2 miles away, which offers Golf, Falconry, Horse Riding and award winning Restaurants. Edinburgh and Glasgow are just an hour away by road or rail and Auchterarder acts as a gateway to the Highlands. An abundance of activities and places to visit. For Cyclists a visit to the Synergy Cycles who offer a selection of top end bikes and cycling goods, e-bikes and guided tours. Tullibardine Distillery where you can enjoy a guided tour by their friendly staff. If the weather is in your favour you can even enjoy a Virgin Balloon Flight. Entrance into The White Cottage welcomes you with spacious entrance hallway with coat stand for all your outdoor gear. The entrance hall gives access to one of the Luxury Double Bedrooms, Fully Equipped Kitchen, Ground Level WC with extra lengthy entrance, and the extremely welcoming and comfortable Dining Lounge. The Lounge has patio doors access to the private rear garden with outside dining option available. Off the Lounge is the lengthy utility room which has its own private door out to the side of the property. Great for cyclists, walkers or golfers to offload their gear upon entering. Stairway to the Upper Level finds you on the spacious Landing with an array of books and comfortable chair you can enjoy peaceful reading time and perhaps a wee dram. Extremely spacious Double Bedrooms with King, Double and Single Beds and ample storage space. Family Bathroom with roll top bath and separate walk in shower. At The White Cottage all towels, linens and toiletries are provided. Travel Cot and High Chair for your convenience - please let us know if you require these at the time of booking. You will also find Guest Tablet in the property which can give access to the Internet, property and local guides. The Cottage is just a five minute walk from the town centre and the world renowned Gleneagles is just 2 miles away which offers golf, falconry, horse riding and award winning restaurants. Edinburgh and Glasgow are just an hour away by road or rail and Auchterarder acts as a gateway to the Highlands. Auchterarder offers 2 well stocked supermarkets, a bank, couple of butchers, post office, as well as plenty of restaurants and takeaway options.